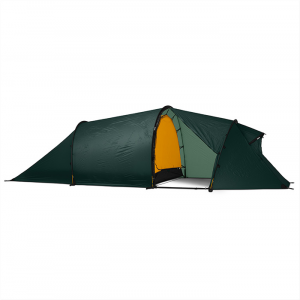 When you need a shelter that stands up to howling winds and snow loads, grab the double-wall, 4-season Mountain Hardwear Tangent 2 mountaineering tent. Its Trident corners add even more strength. 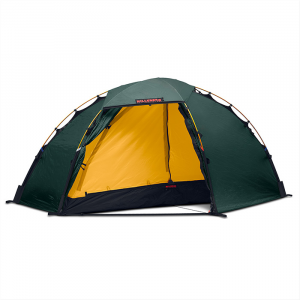 "Mountain Hardwear Camp & Hike Tangent 2 Tent - 2 Person 4 Season 1541291842NONE. The Tangent Tent can withstand significant wind and snow loads by utilizing the Trident Cornera unique design that adds strength and integrity to the tent architecture with only an incremental weight increase." If you're bummed out by having to chose between the airflow of a double-wall tent and the light weight of a single-wall design, quit being blue. 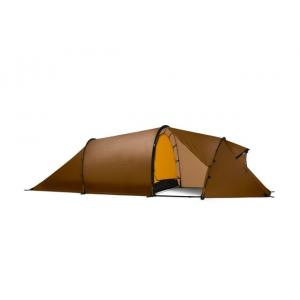 The Tangent 2 Two-Person Four-Season Tent from Mountain Hardwear pitches itself right in the middle of traditional double-walls and alpine-style single-walls, combining the breathability and dryness of a double-wall tent with the weight savings of a single-wall shelter to create an all-weather, all-season home for mountaineers, skiers, and alpinists. 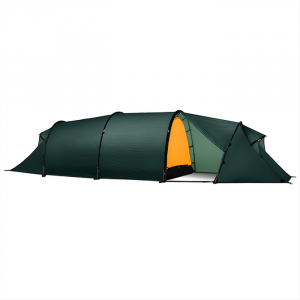 It's the lightest double-walled four-season tent that Mountain Hardwear makes, weighing in at superlight 5. 5 pounds, but is designed to stand up the gnarliest blizzards and worst winds that the mountains can throw at you, with three DAC Pressfit aluminum poles and burly nylon ripstop fabrics. The coolest features on the Tangent are the Trident Corners. 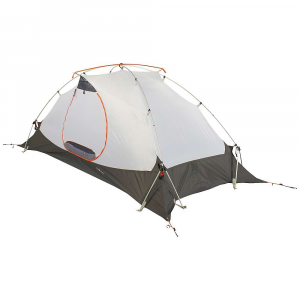 As you might have guessed, each corner uses a three-point anchor system (two poles, and a nylon clip that flexes with the wind), distributing the wind force to 12 points instead of four and shortening the effective length of the poles, making a shelter that's far stronger than traditional single-anchor tents. The Trident Corners also make the Tangent better at bearing heavy snow loads with only two corner-to-corner poles and one small overhead crosspiece. Every guy out uses burly DirectConnect points, and all the corners and anchors are welded for extreme durability. There are mesh vents on the roof and doors, all the seams are taped, and the Tangent's been tested in a rain room to ensure that it's dry as an Arizona tumbleweed in September. 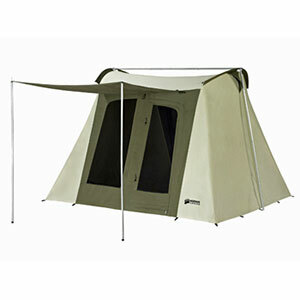 If there's a more versatile, burly, double-walled four-season tent out there, we haven't seen it yet. The Mountain Hardwear Tangent 2 is not available from the stores we monitor. It was last seen March 1, 2019	at REI.